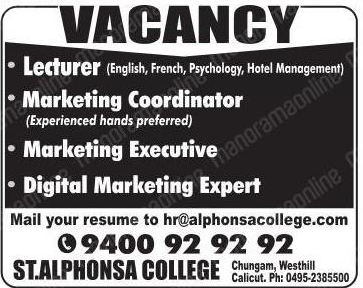 St.Alphonsa College, Calicut has advertised in Malayala Manorama for the recruitment of Lecturer jobs vacancies. Interested and eligible job aspirants are requested to apply by earliest. Check out further more details below. About College: St. Alphonsa group has been derived from Blessed Chavara Educational Trust(BCET) for conducting various professional courses. BCET is dedicated to the great ideals of Fr. Kuriakose Elias Chavara who lived in Kerala one hundred and fifty years ago. Being a humble servant of God with heavenly virtues, he established himself as a scholar, a committed educationist and a philanthropist.